Be the first to share your favorite memory, photo or story of Thomas Ray. This memorial page is dedicated for family, friends and future generations to celebrate the life of their loved one. 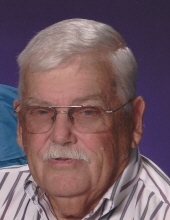 A Cox’s Creek resident, Mr. Thomas Ray “Tommy” Crepps, age 81, passed away Sunday, March 24, 2019 at the Louisville East Post Acute Care Facility. Tommy was born on August 9, 1937 in Bardstown to the late Barnett and Pauline Fields Crepps. He retired from Kroger’s, an Army Veteran and was a member of St. Gregory Catholic Church. Tommy loved going on horse trail rides and raising quarterhorses. He is survived by his wife Mary Patricia “Patsy” Nevitt Crepps, 2 sons, Thomas Patrick (Jeannie) Crepps, Christopher “Todd” Crepps both of Cox’s Creek, 3 daughters, Lori (Ronnie) Hatfield of Bardstown, Shannon (David) Monin of Cox’s Creek, Kim (John) Lippert of Lexington, 2 sisters, Paula Peake of New Haven, Cecilia (David) Hall of Bardstown, 2 brothers, Jimmy Crepps and Bobby (Betty) Crepps both of Cox’s Creek. He is also survived by 11 grandchildren and 5 great grandchildren. A Mass of Christian burial for Mr. Tommy Crepps will be 11:00am Wednesday, March 27, 2019 at St. Gregory The Great Catholic Church with Reverend Peter Do celebrant. Interment will be in St. Gregory Church Cemetery. Visitation will be Tuesday from 3:00-8:00pm with evening prayers and Wednesday from 8:30-10:30am at the Houghlin-Greenwell Funeral Home, 1475 New Shepherdsville Road, who is in charge of arrangements. The family request contributions go to St. Gregory Building Fund in Tommy Crepps memory. To send flowers or a remembrance gift to the family of Thomas Ray "Tommy" Crepps, please visit our Tribute Store. "Email Address" would like to share the life celebration of Thomas Ray "Tommy" Crepps. Click on the "link" to go to share a favorite memory or leave a condolence message for the family.